We posted some vintage photos of our next restoration project, the early '66 GT350 Shelby, last week. 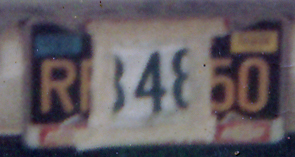 Original California License Plate RFJ 650 from 1966 GT350 Shelby. The paper folded and taped over the tag is the temporary registration for the new owner. One of the interesting things in two of the images that you may have noticed was the original Black and Yellow California license plates. In California, the plate that was registered to the car stayed with the car, as opposed to most states where the plates are changed when the owners changed. Anyway, this is any interesting bit of history for any older model car. Unfortunately, those original California plates on the Shelby are long gone, but there is a company that makes reproductions of most any license plate. The reproduction license plates are for display only, of course, and we think they are quite nice. We even obtained some reproduction California 1966 and 1967 License Plate Stickers to match those in the original photo from a vendor on EBay. We also obtained a reproduction of an original Dana Chevrolet license plate frame that was on the Shelby in those September of 1967 pictures. 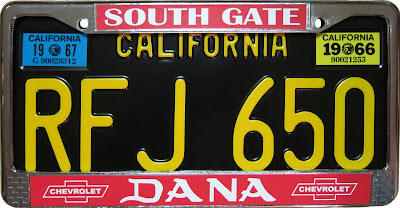 If you are wondering about the Dana Chevrolet License Plate Frame, read our original Blog post that gives a brief history of this early 1966 GT30. A friend with a 1967 Corvette that was originally purchased at Dana Chevrolet reproduces these frames. 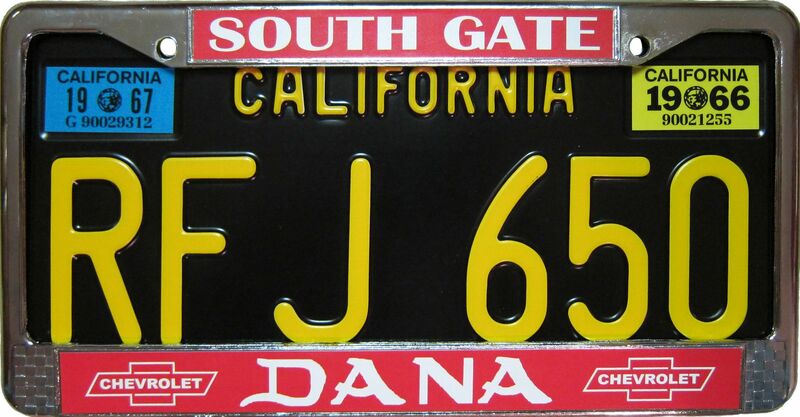 By the way, if anyone out there has an original Dana Chevrolet license plate frame, we would really be interested in purchasing it. We ordered our reproduction Black and Yellow California License Tags from http://www.licenseplates.tv/ .